In celebration of International Women's Day (8th March) the National Cartoon Gallery @ The Bunker, Coffs Harbour is showcasing a special selection of cartoons, from a Bird's Eye View: women cartoonists and their take on the world. The Gallery is open every day from 10 am to 4 pm. and children under 5, free entry. For further information please phone: 6651 7343. Gerry Wedd enjoys a national reputation for his hand-built ceramics that brim with a dry wit, swinging from the humorous to darkly disturbing. His ceramic pieces, both functional and sculptural, are vessels for storytelling about history, politics, music and popular culture. Gerry Wedd: Kitschen Man - JamFactory Icon 2016 is a JamFactory touring exhibition, assisted by the Australian Government through the Australia Council for the Arts, its arts funding and advisory body. For more information ring : 6648 4863, or visit the Gallery Events website. In this exhibition, four artists, who also happen to surf, have created new works in response to John Witzig's extraordinary archive of pioneering images of surf photography. Featuring Jon Campbell, Robert Moore, Gerry Wedd and Ozzie Wright, plus new work by John Witzig. In the Museum's latest exhibition, The Tasma Theatre - Coffs Harbour's Jewel, they take a look at the history of the Tasma Theatre. The Tasma was the pride and joy of business partners Jack Gerard and Lawrence Penn. It opened in March 1937 on the corner of Castle Street and High Street, as Harbour Drive was then known. With an imposing Art Deco façade, it was the grandest building in Top Town and became known as the Theatre Beautiful. For further information visit the Museum website. Small in number, but large in heart: 70 years of Royal Far West in Coffs Harbour exhibition. The 24th of March, 2019 marks the 70th anniversary of the Royal Far West Children’s Health Scheme in Coffs Harbour. 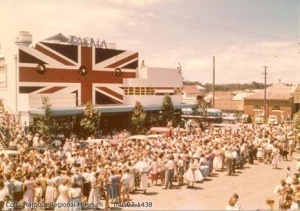 As an integral part of the provision of health care in Coffs Harbour, the history of Royal Far West highlights how members of our community have rallied together, often in the face of isolation, financial scarcity and official indifference, to address the health needs of the Coffs Coast region. This exhibition celebrates Royal Far West’s work in our community over the past 70 years, honouring the energy and commitment of its members and volunteers. The annual Creative Mountain Art Exhibition in Dorrigo is a wonderful presentation of a diverse range of artistic works created by local artists and craft people living on the Dorrigo Plateau. The works exhibited include: painting and drawing, sculpture, ceramics, printmaking, woodworking, fabric craft, jewellery and photography. For more information, visit the Creative Mountain Art Exhibition webpage. A helicopter training squadron adopted by Coffs Harbour will be exercising their rights to the city in a spectacular parade and community event which will commence from outside The Pier Hotel on Harbour Drive. The parade will conclude at the Jetty Foreshores market area with a FREE Sausage Sizzle, Naval Activities, Navy Flypast, jumping castle, face painting and a special Navy Band performance at the conclusion of the parade. For more information, visit the Freedom of Entry webpage. Interested in art? Want to learn art techniques or brush up on your skills ? Find out how art can be a part of your life ! On our open day, you can * talk to the artists * talk to the tutors * talk to the students * see student & tutor works on display * Join us for a BBQ sausage sizzle. Come along to the Coffs Harbour Showground Gallery and check out what the Coffs Harbour Creative Arts Group has on offer with their 2019 Term 2 classes and workshops. For more information, visit the Coffs Harbour Creative Arts Group website. Come along to our group learning session, - iPads & Biscuits. Join up with other iPad users to discover how to use popular social media platforms like facebook. Use an existing account to post status, share photos and videos, like pages and follow others. Learn about account privacy on social media. Bring along your own device or borrow one of ours and we will work through all things iPad apps. Session Time: 10.00am to 12 noon. To register for this session, visit the Eventbrite website. Venture down the rabbit hole to Behind the Lines 2018, the perennially popular exhibition of the year's best political cartoons. After a topsy-turvy 2018, the theme this year is Curiouser & Curiouser, inspired by the surreal charm of Lewis Carroll's Alice's Adventures in Wonderland. Australia's best political cartoonists have worked tirelessly to make sense of the goings-on.